Can you believe Christmas is this week? There's always a long buildup to this holiday that once it's finally here, it feels like it goes by way too fast. I hope you have moments to enjoy the calm and quiet this week amidst all of the celebrations. As the year winds to a close, I've taken one last trip through the archives and rounded up our Best Renovation Decisions from our (slow) whole-house renovation. There's a concept in architecture known as 'unlocking the plan'. It refers to the situation where there is an obstacle or problem that is blocking the design or full potential of a room, building or site plan. Once you have a 'lightbulb moment' and find a way to clear that obstacle, all other pieces fall into place and you're able to come up with a successful design. In our house, we had two clear instances where addressing the obstacles - with ultimately very simple solutions - allowed us to unlock the plan. When faced with an awkward room layout, most times you learn to live with it and arrange your furniture wherever it will fit. 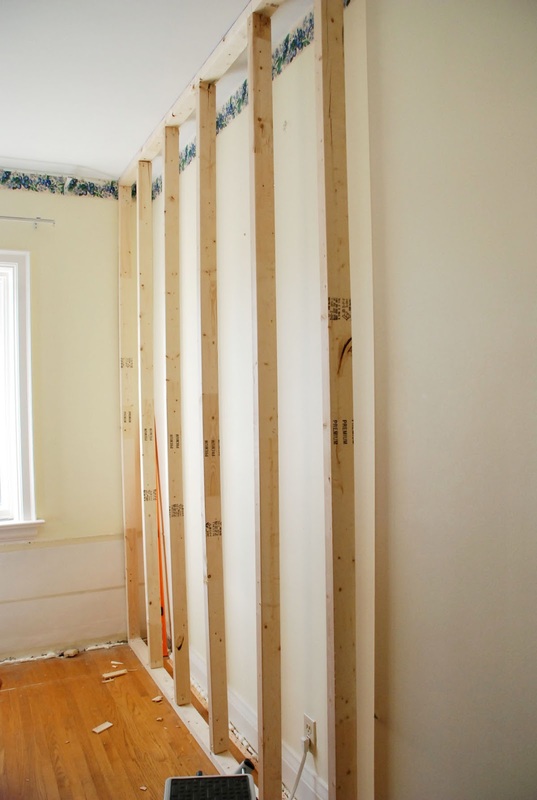 In our master bedroom, a portion of the wall opposite from the bedroom door was bumped out. The bump out housed pipes and couldn't be moved. It was off-centre and forced us to place our bed on the opposite wall and tuck our dresser in the corner - neither of which ever looked nor felt quite right. But we found a solution: frame and build a new wall in front of the bump out. We lost about five inches with the framing and drywall, but we gained a more logical room layout. 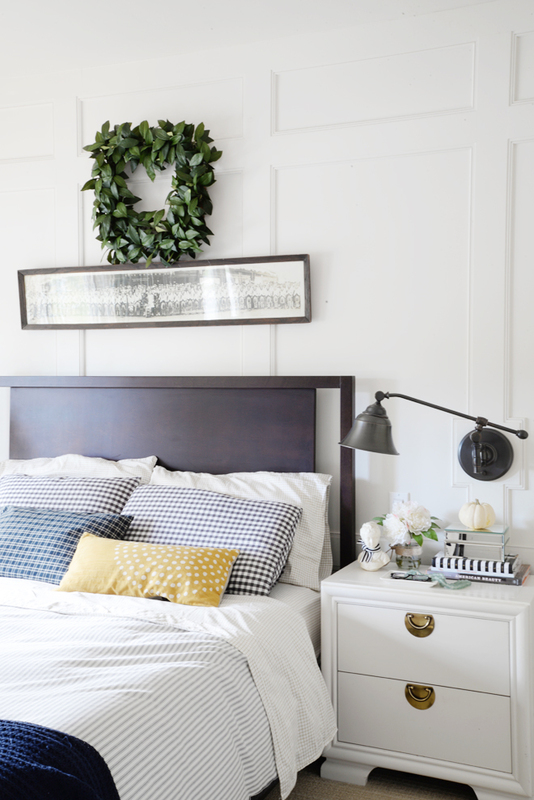 Once the new wall was in place, we were able to create a focal point with a panelled wall (still my most popular project ever) behind our re-located bed. Another instance of removing an obstacle happened with our basement renovation. 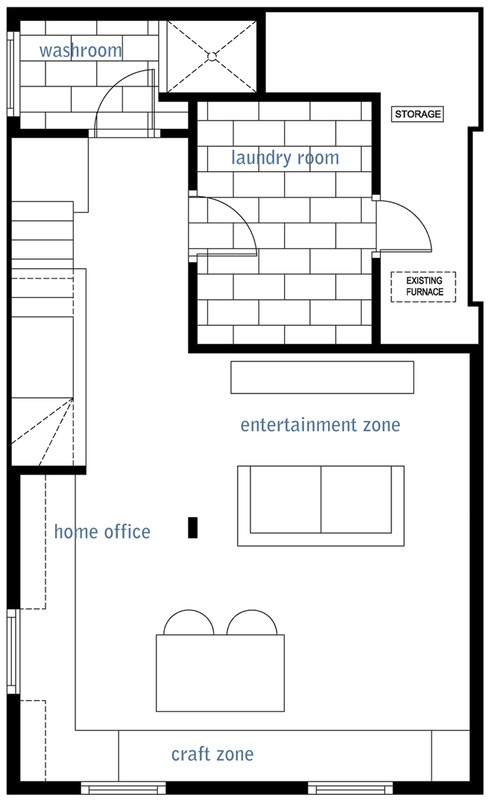 We struggled with over half a dozen layout options for our 650 sq ft basement. Ultimately, by making one very simple change - rotating the furnace 90 degrees - we were able to plan the space more efficiently. Lesson learned: Removing walls isn't the only way to deal with awkward rooms or layout challenges. Spend the time to really think about your plan and see if there are other solutions. 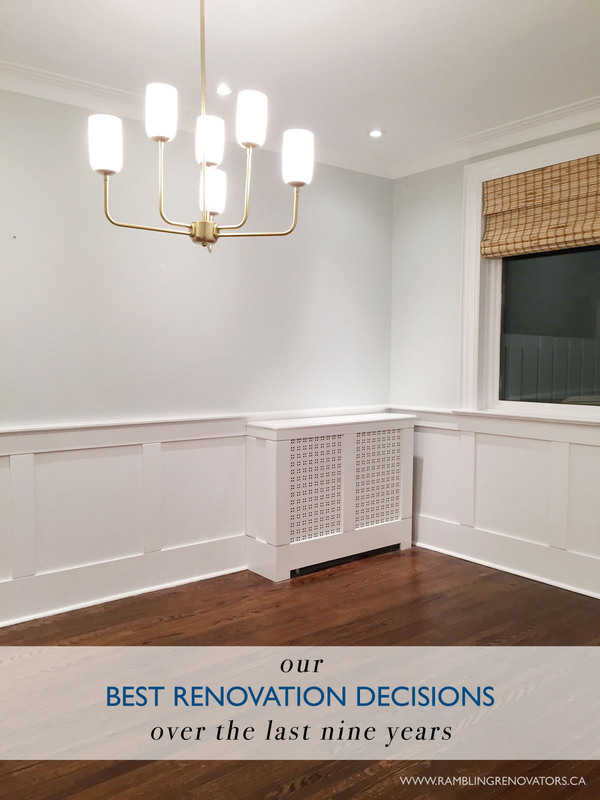 If you look at our renovations, one thing becomes obvious: we love built-ins. When you live in a small house (ours was 1300 sq ft excluding the basement), built-ins are essential. 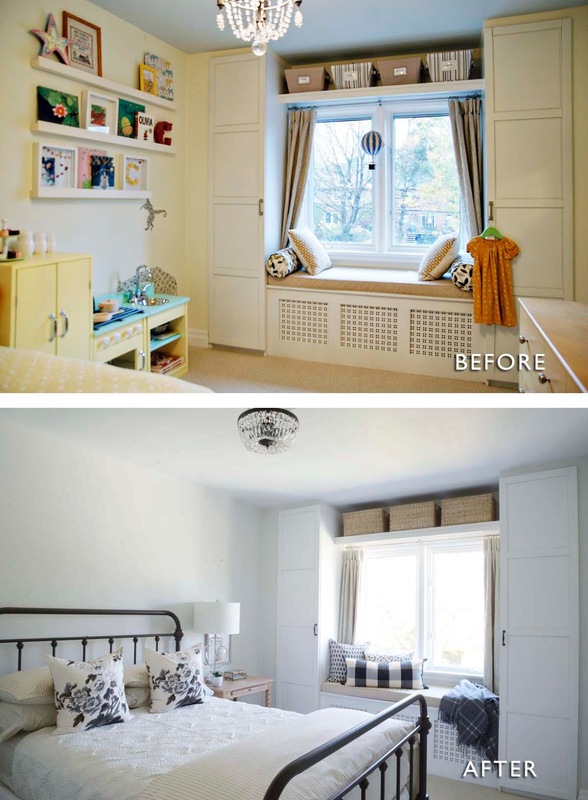 They provide room for storage but they also help infuse character into plain rooms. When we first moved in, the spare bedroom was lacking in any type of closed storage. With a baby on the way, we needed to have closet space for this soon-to-be nursery. Sean built a custom bench over the radiator beneath the window and flanked it with a pair of Ikea PAX wardrobes. He added filler panels to make the wardrobes look built-in. 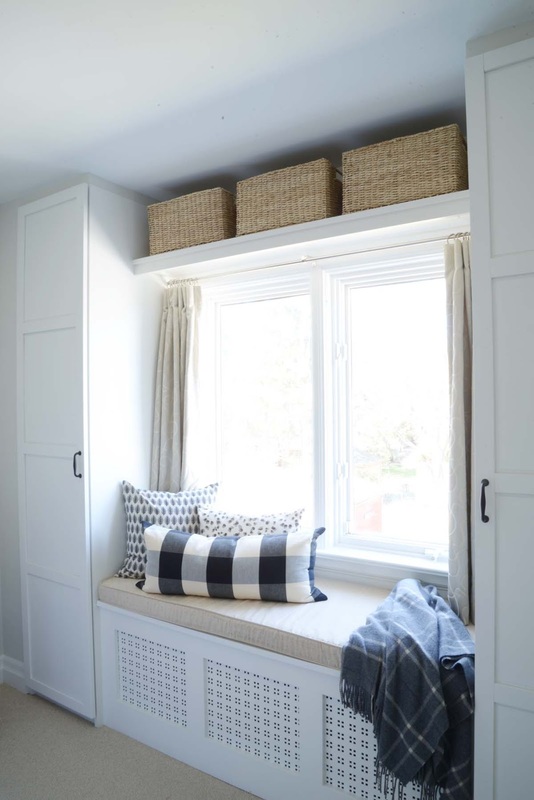 To maximize the storage, we put a shelf above the window with additional room for baskets. We created similar built-ins using off-the-shelf units as a foundation for Chloe's closet and for her Window Bench + Bookcase. While these cabinets benefitted us, they also proved to be a strong selling feature of our home. Lesson learned: consider customizing off-the-shelf products to save on renovation costs and to get a custom look suited to your personal style. When you renovate one room in your house, there might be the chance to make improvements in other rooms of your house at the same time. This can lead to scope creep (and a ballooning budget) if things get out of control, but you might want to take advantage of some unexpected opportunities. 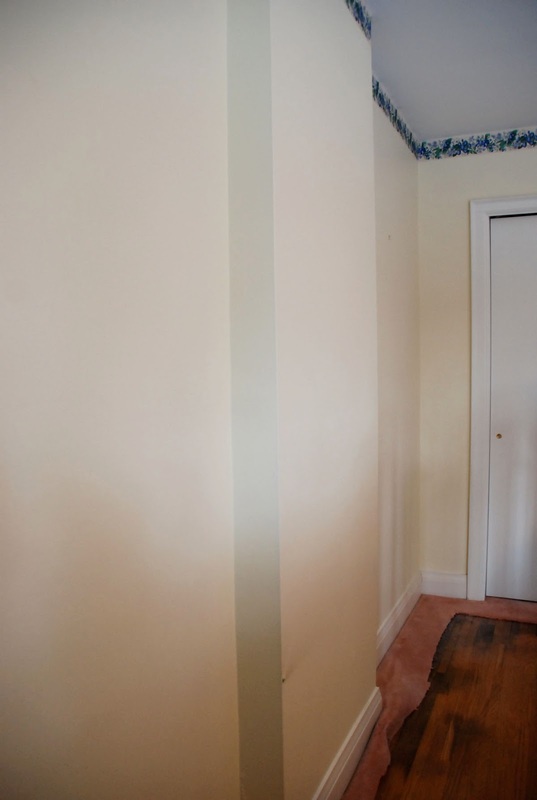 When we created the new wall in the master bedroom, we used that opportunity to fill the void with sound insulation. We lived in a semi-detached house and when new neighbours with three kids below the age of four moved in next door recently, we found out just how wise that decision was ;) When we renovated our kitchen, we had the electrician leave extra wiring in the walls for the eventual potlights we'd put in the adjoining dining room. And in the basement, before drywall was installed, we added plywood blocking in the areas we knew we would be hanging a tv and heavy artwork. Lesson learned: When you have the walls open and what's behind the walls exposed, consider if there's any minor improvements you could make. 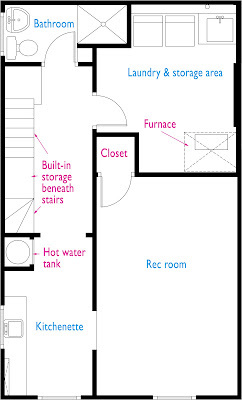 - The in-floor heating in the laundry room and two bathrooms were some of our best decisions. Tile floors, especially in the basement, can feel frigid but with in-floor heating you're able to notice the surrounding room and decor instead of only noticing how cold your feet are! 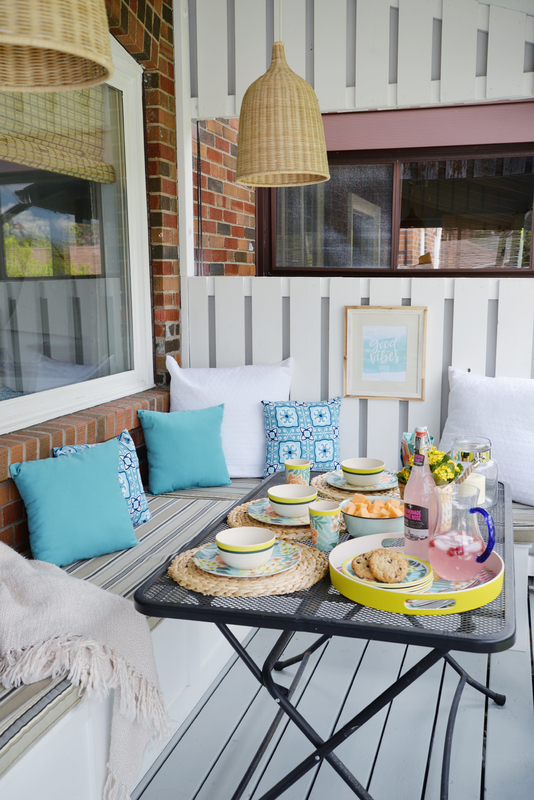 - The DIY outdoor bench transformed our back porch from just a space to a real extension of our house. With ample seating, it became a place for family meals and an outdoor office in the summertime. - The frosted doors on the bathroom and laundry room helped bring additional light into these small spaces. The style of the doors (shaker style with an inset panel trim) along with the decorative decal brought traditional charm to our 1950's house. And with that, this chapter of our house story is done. It's so nice to have this blog to look back on and see all the changes we've made. I'm incredibly touched that many of you have been reading along to witness those changes. Thank you for the comments, encouragement, ideas and support you've shown me over the years. Time for us to close the door of this house and move onto the next one. I hope you'll join me for the next adventure!